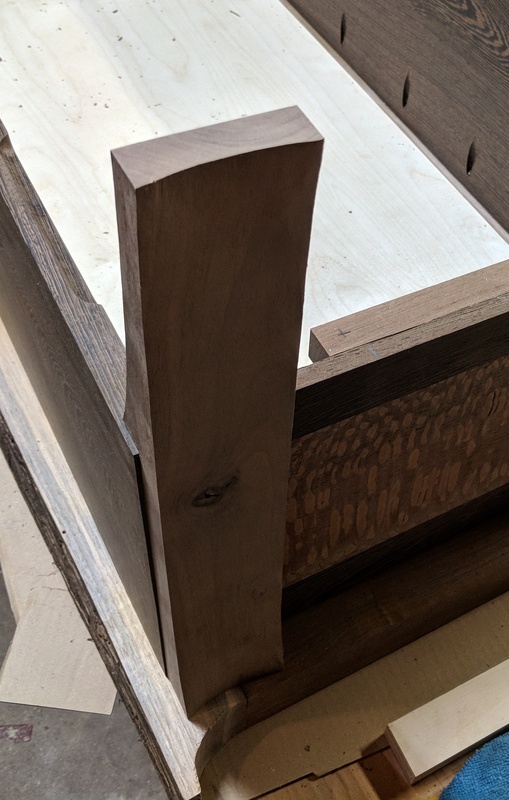 I'm trying to create a curved coffee table leg - I'll bandsaw the profile, but then I'd like to give the face (the face created by the wood exposed by the bandsaw cut) a long concave recess. It'll look like a less-extreme piece of celery, if that makes sense. I was thinking about doing it with an angle grinder. Any issues/tips/other ideas? If the leg is straight along its length you might also be able to use a router to block out the cross section profile. Make certain that the leg is securely anchored before applying the grinder. It will be easy for the grinder to dig in a pull the piece off your bench. Test drive the grinder on sacrificial pieces before attempting it on your actual wood legs. Odds are you will not get it right the first time (or two, or three, or ...) and you will learn important techniques. Your experimental pieces should be of the same or similar species to your final leg. Soft woods may not respond to the grinder the same as hard woods. I would suggest selecting straight grain stock for the legs that is free of knots or burls. Straight grain might make long grinding strokes more uniform, although with a tool as aggressive as the grinder that may not be an issue. Knots are much more dense and will be much more work to hand finish. You will need multiple grinding wheels with different grit sizes and you will probably end up doing a great deal of hand sanding to get an acceptable surface for finishing. Safety first, use goggles and face mask. You may be tempted to remove the guard to get deeper access in the depression. This is not recommended, however, should you attempt this wear heavy clothing including thick gloves. Good luck and consider adding an answer to the question with your experience including a picture when you are done. If I am understanding what you are looking for, I have been able to do this by passing a piece of wood diagonally across the blade of a table saw. I also know that is not the normal way that a table saw is used. So, to get to your desired depth, make A LOT of passes. When I do this, I start with the blade so low, that it takes barely any wood off. After that I raise it, just a bit. Also each time, I am checking how the wood is looking, the depth of the cove, and of course readjusting my fence. Where's Roy Underhill when you need him? 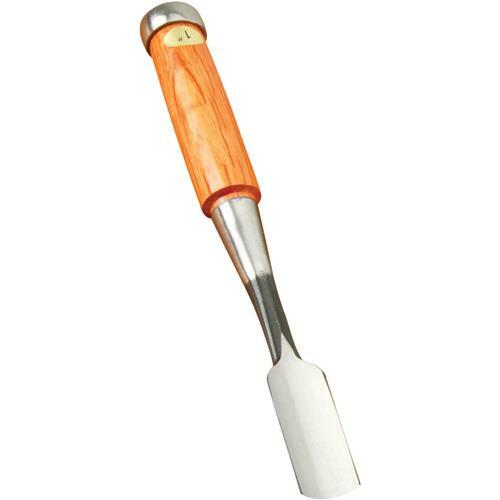 This sounds like it would call for a gouge chisel like this one and some hand carving. It might not be quite as quick as the angle grinder, but would probably be much more precise and much less likely to accidentally take off too much. On the other hand, by significantly reducing the likelihood of removing too much material, it might be much quicker in that you most likely won't have to redo any legs. Here's what I ended up doing: bandsaw to cut the profile, spindle sander with a large-radius drum to hollow out each end, hand sand to taste. There's not a huge amount of recess in the middle, but the eye doesn't really notice, and the leg itself came out of the bandsaw much thinner than I was envisioning. After all of the necessary requirements were met, the 2 1/4" blank was about 1" thick. Not the answer you're looking for? Browse other questions tagged technique carving grinder or ask your own question. How do I achieve inset edge beading? Carving a wooden handle - any rules of thumb?